Nowadays, most women have more than one purse. Like anything else you have more than one of, you need to consider how you store your precious items. As you know, purses are not cheap. You can spend a few hundred dollars all the way upto thousands. Here are some thoughts of what you should consider when storing your precious handbags. If you’re using certain purses often throughout the week, consider keeping them in open shelving. Precious expensive purses should be kept behind doors, whether glass or solid. Glass doors at least allow you to see them at a glance which can be handy for those of you that take a while to get dressed, you know who you are! Another plus for keeping your precious finds behind doors are keeping unwanted hands off of them as well as keeping dust at bay. If the fabric or leather is indeed expensive, dust and grime in general is something you want to avoid. Some folks prefer to hang their bag by their handles. Do NOT consider this! Handles can be stretched and in time, this will ruin your fashion investment. Like any other piece of your wardrobe, treat them how you would one of your family members, gently. 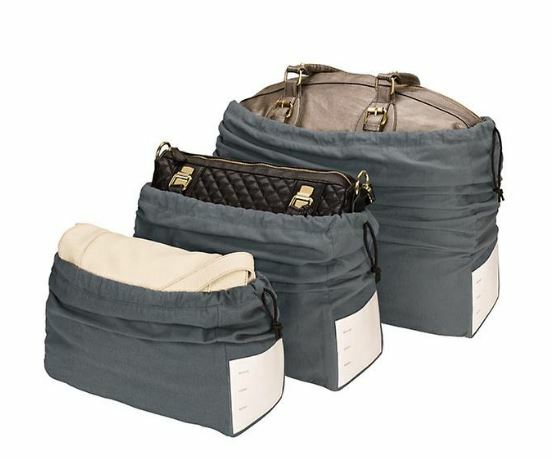 If you are indeed serious about storing your handbags, a soft cotton storage bag is indeed what you should be considering. The best manufacturers have a variety of sizes with drawstring and a label on the side. Keeping your handbags and purses in order, consider as well dividers. Whether they are glass, metal or solid, dividers are a great way keeping everything neat as well as not having any touch. Some leathers are oiled and you definitely wouldn’t want them touching an absorbent fabric. Dividers as well work best if they are adjustable. As you can imagine, not all of your purses, handbags and clutches are the same size. Organize them accordingly!